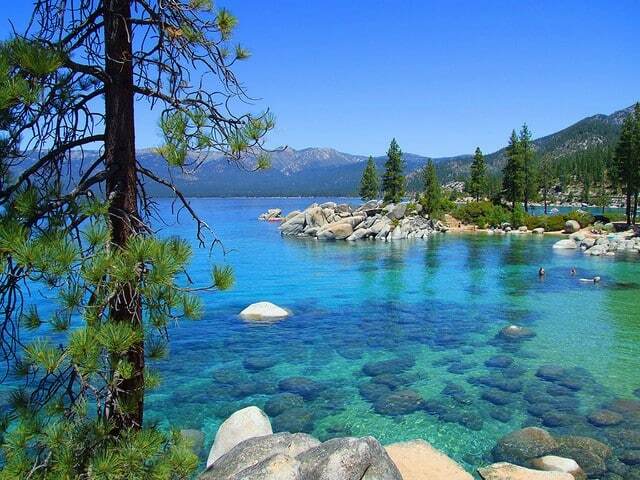 Lake Tahoe is the largest alpine lake in North America, and the second deepest in the United States. Its clear blue-green waters and tall conifers certainly make it one of the most photogenic lakes in North America. But besides the usual lake activities the Lake Tahoe area has something special to offer foodies — traditional American-Basque food. Basque immigrants came to the west coast in the 1840s as part of the gold rush. Those who weren’t lucky enough to find gold stayed as shepherds–a traditional pass time of the European Basques. Basque-American shepherds spent months with their sheep in sage country and then herded them to places such as Gardnerville and Reno in the Lake Tahoe area and Winnemucca and Elko in other parts of Nevada. Other Basques opened up boardinghouses to serve them. The few that remain are great places to eat authentic American-Basque Food. So What is American Basque-Cuisine? American Basque food is more meat heavy than that of Europe. There are a lot of lamb dishes as a result of the shepherding that drew the Basque to the area in the first place. 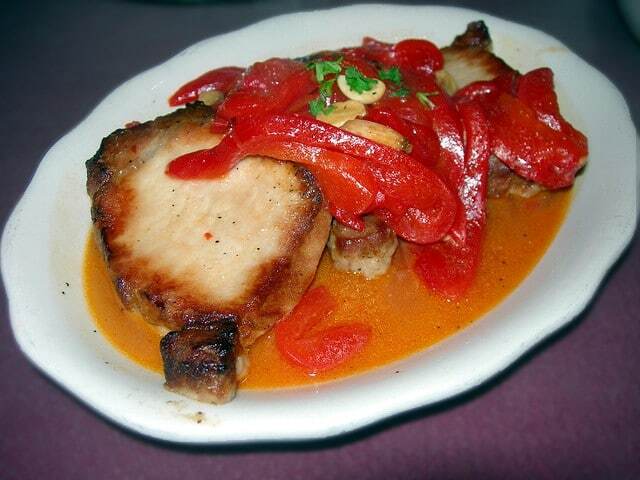 Lomo, breaded pork cutlets with peppers, is one example of Basque cuisine. You might also find lamb pork chops garnished with garlic. Lamb stew was also a staple. Other entrees include chicken that’s been grilled and fried, or sweetmeats. The entree is the only thing you order, but certainly not the only thing you will be served. Side dishes might include tripe, blood sausages, tongue, pigs-feet, and “Rocky Mountain Oysters.” Enjoy beefy onion soup, paella, garlicky lettuce and beans, chorizo sandwiches, and burgers all served family style, at long tables that were the most practical way to seat a multitude of shepherds. Most of the time the meal will be served with a red table wine–but you can also check out Picon punch. This cocktail is purely American Basque and will not be found in the old country. It is usually made with grenadine, club soda, brandy and Amer Picon (a French apertif made with herbs and burnt orange peel). It’s pretty heady stuff. The authentic Victorian building that houses J.T. 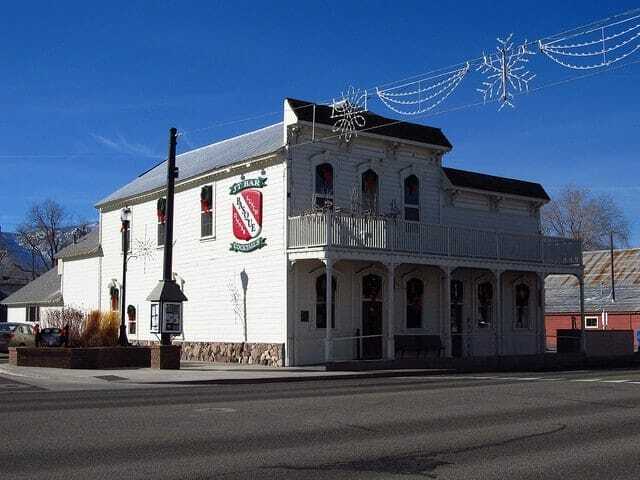 Basque Bar and Dining Room has served as a hotel, saloon and dining hall throughout its more than 100 year history in downtown Gardnerville. The Restaurant has been run by the Lekumberry brothers, emigrants from the French side of the Pyrenees, and their descendants since 1960. Originally “Jean tended bar, Uncle Pete cooked up the hearty family-style meals, and Shirley (Jean’s wife) ran the dining room and the upstairs hotel.” These days Jean and Shirley’s descendants serve up entrees including: top sirloin steak, lamb shouleer steak, Basque chicken, sweetbreads, pigs feet with tripe, lamb chops, shrimp scampi and roasted rabbit. The family style accompaniments include: soup, salad, stew, beans, french fries, bottle of red wine, coffee & ice cream. They’ve been voted the best Basque restaurant in the Carson Valley for over a decade. The historic Overland Hotel was built in 1908 by Dan Griffith, a local pioneer. “Located on America’s First Transcontinental Highway, the Lincoln Highway, the Overland became the destination of all walks of life: from ditch diggers and local ranchers, to politicians, civic leaders and weary travelers.” Enjoy lamb (T-bone) and Rib eye steak, French onion soup, salad, and beans family style. Every table has a bottle of red wine. And . . . psssttt . . . the hotel is supposed to be haunted. 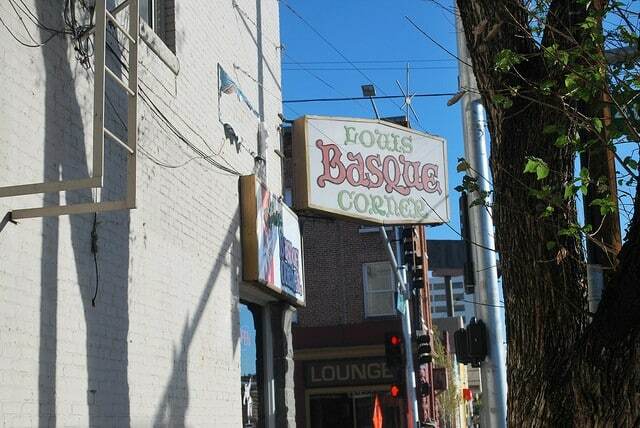 Louis and Lorraine Erreguible opened Louis’ Basque Corner in 1967. “An emigrant from Mauleon, Basses Pyrenees, France, and a World War II veteran, Louis’ love of Basque cuisine and experience as a chef at local restaurants led to the renovation of the 1906-built Lincoln Hotel and the start of a Reno tradition. Today, owners Chris Shanks and Brian Elcano carry on Louis’ Basque tradition.” Dinners are served in the traditional family style. Try paella, shrimp and tongue Basquaise, oxtails, tripas callos, lamb chops and sirloin steak. 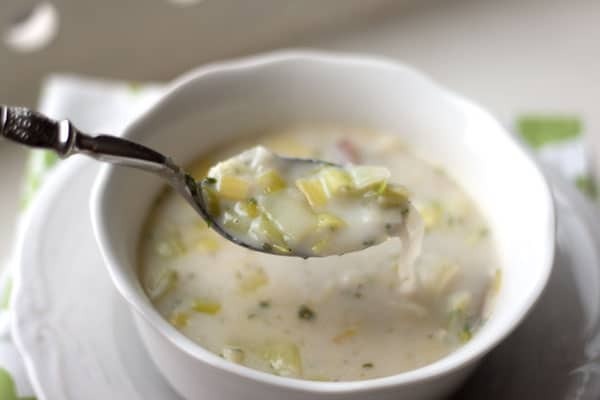 The family style dinner includes and entree and soup of the day, French bread, Basque beans, salad, French fries, first course, main entree, dessert, and complimentary house wine or soft drink. 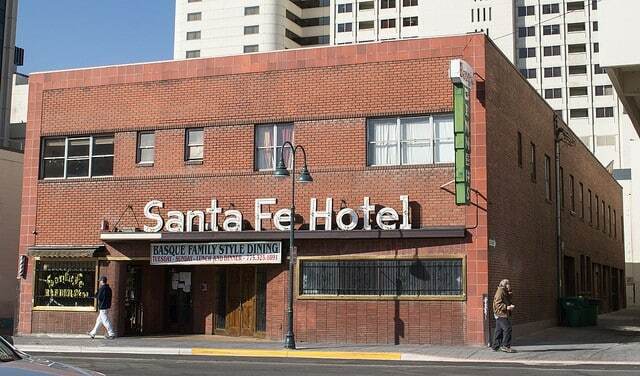 The present location of the Santa Fe Hotel dates back to 1948 when it was rebuilt after a fire. Start your evening with Picon Punch, order your steak, lamb, pork,chicken or seafood entree and then sit back as they roll out the side dishes which might include sweetbreads, tongue stew, lamb stew, Santa Fe chicken, paella, or oxtail stew. Save room for dessert, they serve such traditional ones as Gateau Basque, bread pudding, and flan. Which “way” do you want your Cincinnati Chili? What a cool and unique scene. I’m liking it! The food looks amazing! Happy Sunday!